The Pentagon is the World's largest office building in terms of floor area. With 6,500,000 sq ft, it is twice the size of the Merchandise Mart in Chicago, and has three times the floor space of the Empire State Building in New York. The building was originally designed as a temporary facilty. The building was designed by the American architect George Bergstrom and waslocated in Arlington County, Virginia. The building has no marble because it was built during World War II, and Italy, the source of marble, was an enemy country. It has 131 Stairways, 19 Escalators and 13 Elevators. Over 1,000,000 emails and 200,000 telephone calls are made from Pentagon daily. Over 1,200,000 postal mails are sent / received daily. It held 33,000 people at its peak in the 1950s. The first occupants moved into the building in 29 April 1942. On September 11, 2001, exactly 60 years after the building's groundbreaking, hijacked American Airlines Flight 77—a Boeing 757-223—was crashed into the western side of the building. There are seventeen and a half miles of hallways within the Pentagon. It is so huge that it’s been assigned six different zip codes. The Pentagon is home to 4,200 different clocks. There are twenty-three thousand employees within their walls. There are more than 200,000 phone calls and 1,000,000 emails sent and received on a daily basis. It is shaped like a pentagon because of where the roads were positioned that surrounded the original building site. The windows in the Pentagon are glass panes that are two inches thick and weigh almost 1 ton each. The windows do not open. The tragic attack of Sept. 11th 2001 happened exactly 60 years to the day, from when ground was first broke for the Pentagon’s construction. The Pentagon and its parking lots are used as a staging area for a number of large events. 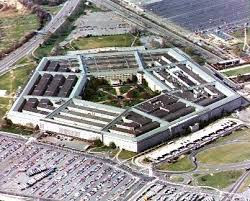 The name, 'The Pentagon', has now become synonymous with the military and United States Department of Defense. It is a mini-city, with shopping and restaurants, medical facilities, post office, mini-mall, Metro station, heliport, fire station, heating and refrigeration plant and sewage treatment facility within the facility. It is bigger than nine out of 10 U.S. towns.